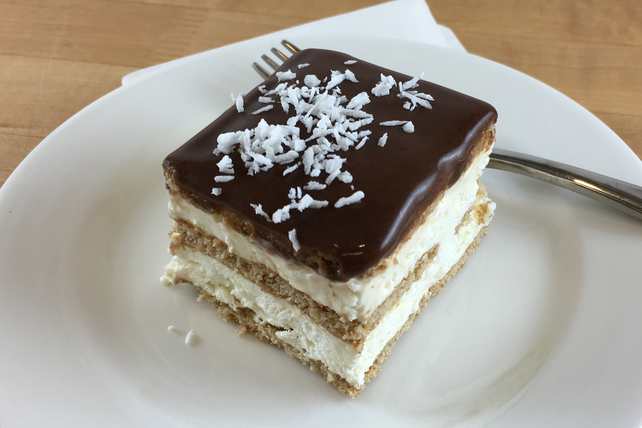 Graham Cracker Chocolate-Coconut Eclair "Cake"
This no-bake dessert is guaranteed to win rave reviews. Graham crackers are used to replace puff pastry in this simplified version of the classic dessert. And a fun twist is the addition of coconut to this crowd-pleasing dessert. Beat pudding mix and milk in medium bowl with whisk 2 min. Let stand 5 min. Reserve 2 Tbsp. coconut. Add remaining coconut to pudding along with the Cool Whip; whisk just until blended. Arrange 9 wafers on bottom of 9-inch square pan; cover with half the pudding mixture. Repeat layers. Cover with remaining wafers. Refrigerate 3 hours. Spread with Baker's Chocolate Frosting just before serving; sprinkle with remaining coconut. Serve topped with your favourite sliced fresh fruit. Use a serrated knife to cut the dessert into pieces, carefully wiping the blade clean after each cut.